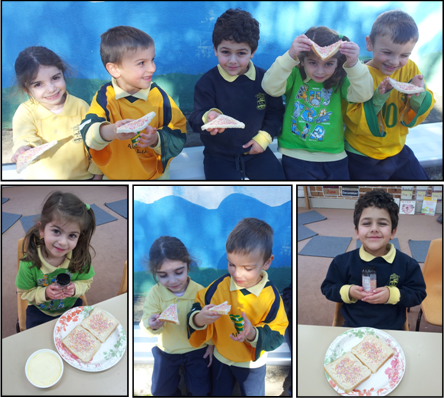 AGBU Alexander Primary School - Blog: NEWS FROM PREP/K... FAIRY BREAD! For writing this week, Prep and Kindy learnt and wrote a procedure on how to make fairy bread. We needed a knife, a plate, bread, butter and Hundreds & Thousands. 1. Put the bread on a plate. 2. Spread the butter on the bread with a knife. 3. Sprinkle the Hundreds & Thousands over the bread. 4. Cut the bread in half and eat it! We made enough Fairy Bread to share with everyone. It was a lot of fun to make and even more fun to eat!